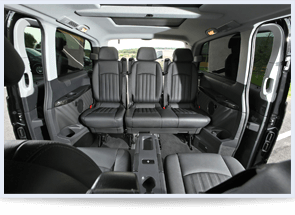 Mercedes Viano chauffeur car represents Mercedes luxury on a grand scale and is suitable for groups of up to seven people and their accompanying baggage. Giving a new dimension to supremely comfortable group travel, Mercedes Viano is a sublime people carrier perfectly suited to our fleet of London chauffeur driven vehicles. Thanks to Mercedes’ engineering nous, the Viano offers the same level of style and elegance as our Mercedes S Class chauffeur cars with the convenience of being able to travel with a larger group of colleagues, friends and family members. Mercedes Viano boasts comfort suspension, which has been designed to give an ultra smooth journey. It also counts noise reduction properties amongst its many assets, adding to the simple pleasure of exploring London or travelling to and from any of the capital’s international airports. This sumptuous people carrier boasts conference seating, climate control, multi-speaker surround system, and much more. What makes Mercedes Viano especially impressive is that as well as being a first class mode of transport it also offers the benefits of a mobile office with handy power points for charging phones and other devices while on the move. Thanks to its ample seating, the Mercedes Viano makes a wholly practical yet effortlessly indulgent wedding car. The ideal size for chauffeuring entire families or groups of friends, it also makes for sleek, efficient transportation when ushers, bridesmaids, page boys and maids of honour all need to arrive at the church on time.